The Central Library Gallery is located on the first floor of the Central Library between the entrances and overlooking Phoenix Park. The Central Library Gallery has been in operation since the Central Library opened in 1989. The Gallery hosts six to eight exhibits each year. 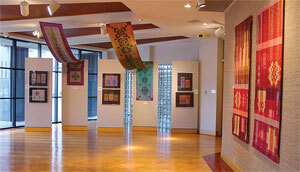 Exhibits feature artists from the region and around the world, as well as historical and other educational exhibits. The Eastside Gallery wall is located in the hallway to the Children's wing of the Eastside Branch, which is on the corner of Man 'o War Boulevard and Palumbo Drive. This space focuses on family-friendly, local art, historical, cultural, and educational exhibits. For more information about Lexington Public Library's gallery spaces, contact the gallery curator at gallery@lexpublib.org or (859) 231-5559. To submit your work for consideration for exhibits at either of our gallery spaces, please fill out the form below. Please note that any work that may be exhibited on the Eastside Gallery Wall must be family friendly. *Please submit 5 images and/or a website of your work, plus any additional information (for example: artist statement, artist bio., etc.). The Library has several exhibit areas. The curator will contact you if and when there is an opening for your exhibit. Thank you for your interest in Lexington Public Library exhibits. *Click "Browse" each time you want to add an image for multiple images.